^ Java 5.0 增加了多種新特性（包括foreach迴圈，自動裝箱、拆箱（英語：Object type (object-oriented programming)#Autoboxing），可變參數函式以及annotations）, after they were introduced in the similar (and competing) C# language. ^ Niklaus Wirth stated on a number of public occasions, e.g. in a lecture at the Polytechnic Museum, Moscow in September, 2005 (several independent first-hand accounts in Russian exist, e.g. one with an audio recording: Filippova, Elena. Niklaus Wirth's lecture at the Polytechnic Museum in Moscow. 2005-09-22. ), that the Sun Java design team licensed the Oberon compiler sources a number of years prior to the release of Java and examined it: a（relative）compactness, type safety, garbage collection, no multiple inheritance for classes – all these key overall design features are shared by Java and Oberon. ^ Patrick Naughton cites Objective-C as a strong influence on the design of the Java programming language, stating that notable direct derivatives include Java interfaces（derived from Objective-C's protocol）and primitive wrapper classes. ^ In the summer of 1996, Sun was designing the precursor to what is now the event model of the AWT and the JavaBeans TM component architecture. Borland contributed greatly to this process. We looked very carefully at Delphi Object Pascal and built a working prototype of bound method references in order to understand their interaction with the Java programming language and its APIs. ^ The History of Java Technology. [2012-10-06]. ^ Java 5 catches up with C#. www.barrycornelius.com. ^ Lévénez, Éric. Computer Languages History. www.levenez.com. ^ Gosling, James; McGilton, Henry. The Java Language Environment. May 1996. ^ Gosling, James; Joy, Bill; Steele, Guy; and Bracha, Gilad. The Java Language Specification, 2nd Edition. ^ The A-Z of Programming Languages: Modula-3. Computerworld.com.au. [2010-06-09]. （原始內容存檔於2009-01-05）. ^ Java Was Strongly Influenced by Objective-C. cs.gmu.edu. ^ A Conversation with James Gosling – ACM Queue. Queue.acm.org. 2004-08-31 [2010-06-09]. ^ White Paper About Microsoft's "Delegates"
^ Facebook Q&A: Hack brings static typing to PHP world. InfoWorld. 2014-03-26 [2015-01-11]. ^ Byous, Jon. Java Technology: An Early History (PDF). Sun Microsystems. 1998 [2010-11-24]. （原始內容 (PDF)存檔於2011-07-19）. ^ 什麼是 Java？為何需要 Java？. www.java.com. [2018-04-11] （中文（中國大陸）‎）. Jon Byous, Java technology: The early years。Sun Developer Network, no date [ca. 1998]。Retrieved April 22, 2005. 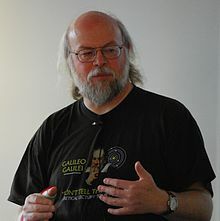 James Gosling，A brief history of the Green project。Java.net, no date [ca. Q1/1998]。Retrieved April 22, 2005. James Gosling，Bill Joy，Guy Steele，and Gilad Bracha，The Java language specification, second edition. Addison-Wesley, 2000. ISBN 0-201-31008-2. James Gosling，Bill Joy，Guy Steele，and Gilad Bracha，The Java language specification, third edition. Addison-Wesley, 2005. ISBN 0-321-24678-0.